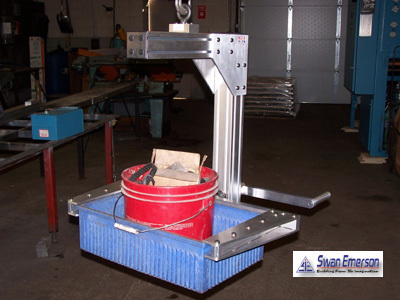 The Bin Dumper was developed as a manually operated material handling aid. It allows handling of loaded bins, weighing a maximum of 50 lbs, without the operator performing the actual lifting and dumping. To perform a dumping action, the operator simply turns a lever located at the rear of the dumper. The Bin Dumper has greatly reduced operator fatige and muscle usage.